Enjoy it, men. You have two weeks left until the voluntary offseason program begins. After a disastrous 2018 season, the Jaguars have work to do on the field and in the locker room. We’ll break down numerous key storylines over the next two weeks to get you ready for OTAs. Today’s initial offering focuses on new starting quarterback Nick Foles. The leadership component will be a big part of Phase One. Let’s see what you can do, Nick. The former Philadelphia Super Bowl MVP signed a four-year, $88-million contract with $50.1 million guaranteed on March 13. His responsibility isn’t just to provide an on-field upgrade to former starter Blake Bortles, but help invigorate a team that lost its harmony in a 5-11 disappointment. The rules for this two-week portion state that only strength and conditioning coaches can be on the field with a 90-minute max. The players can be in the facility for four hours a day during Phase One, only two of which can be specified by the team. The player can determine the other two hours to fit his schedule. This is a time that is players-based. 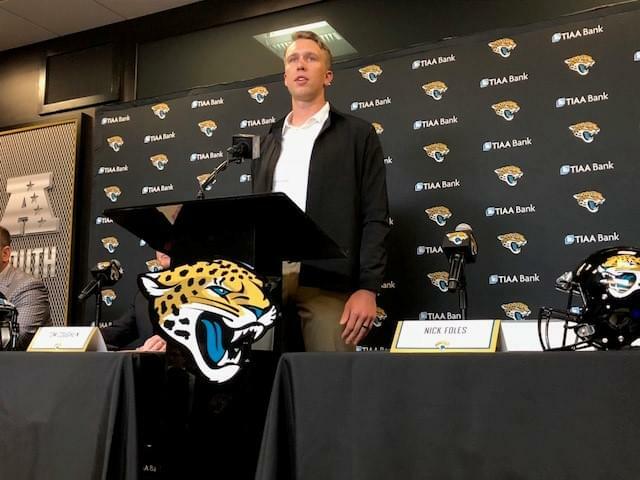 If the Jaguars are going to grow as a team, the players have to take the initiative because of how strict the collective bargaining agreement makes Phase One on the coaches. That’s where Foles comes in big. His ability to lead has been praised by his former team almost as much as his on-field production. That’s quite a compliment considering what Foles has accomplished over the last two postseasons. The Jaguars players will all rave about Foles’ leadership when asked in future press conferences. We know that. However, it’s the little nuggets of information you pick up on that will reveal how well it’s going. Foles should be able to win over a humbled locker room. How he goes about that process will be fascinating.